¶ 1 Leave a comment on paragraph 1 0 In an ongoing EU FP7 Era.NET RUS project,1 utilizing a mixed-method approach (interviews/focus group (n=145) in four countries; online teaching style survey), we, among others, researched how instructors and students in higher education (HE) use social media (SoMe) for teaching, learning, and research. We revealed potential benefits of SoMe usage by instructors in HE classrooms. However, although many instructors are open-minded about applying SoMe in their teaching contexts, they often face difficulties when deciding how to integrate it in their instructional designs. Therefore, we developed a SoMe toolkit that will (a) assess the instructor’s teaching scenario by asking four questions, (b) suggest the best matching SoMe class by utilizing an algorithm based on pedagogical principles, and (c) provide instructional tips for the instructor on how to integrate the suggested SoMe class in his or her teaching. The pedagogical framework of the toolkit will be presented in detail in this paper. At the conference, you will be able to test the toolkit’s functions, see the users’ data entry visualized in nearly real time, and have the opportunity to give feedback and discuss. ¶ 2 Leave a comment on paragraph 2 0 The use of SoMe has been gaining popularity in recent years. Although instructors realize possible educational gains from using it in an educational context, a detailed literature review and current research findings (a complementary research project focusing on determining and evaluating measures that can assist in using SoMe media for teaching and learning purposes has been recently started by Gruzd et al. (2013)) of this project have revealed that only a small number of instructors are aware of the potential educational benefits of SoMe use in the classroom. Similarly, although most students use SoMe in their daily lives, they are often not used to or are sometimes against the idea of using these social environments for instructional purposes (for more information about students’ (social) media literacy at Zurich University of Applied Sciences (zhaw), see data collected (n=928) by Lim (2013)). However, it is also obvious that, when used properly, SoMe can turn into an effective social and unbound learning environment for students, who benefit individually from using it for their learning purposes. Similarly, observing good examples and making effective use of SoMe can lead instructors to become aware of its potential benefits, both for themselves and for their students. Thus, our cases of SoMe implementation in HE in different cultures have shown that SoMe can be used as an effective learning environment to support traditional courses (similar findings have been supported by Göldi et al. (2012), who also focus on institutional factors for SoMe application in HE, and by Bittel (2014), who trains instructors in SoMe usage for HE)). Using SoMe makes it easier to reach students, communicate with them 24×7, and extend communication beyond the confines of the classroom. It also encourages peer learning, group work, and socialization among students (Gulbahar, 2014). ¶ 3 Leave a comment on paragraph 3 0 This paper aims to present the social media toolkit designed to (1) analyze the teaching scenario for an instructor in HE, (2) decide on the best social media type through an algorithm2, and (3) provide instructional tips about the best matching social media type usage in educational context. Hence, the process of development of this toolkit will be explained in detail throughout this paper. ¶ 4 Leave a comment on paragraph 4 2 The first and main task undertaken was the identification of the classes of SoMe services, since the toolkit is supposed to suggest one class to the user. SoMe services were classified according to the study done by Bower, Hedberg, and Kuswara (2010), who proposed eight classes. Two classes (“social bookmarking” and “research”) were not relevant in our context and therefore omitted. ¶ 5 Leave a comment on paragraph 5 0 As Table 1 below demonstrates, we grouped the numerous SoMe services that exist on the Internet into six classes. The services included in each class were selected only as examples for their possible use in the teaching-learning process. Since new features are being added to SoMe services almost every day, this classification may need to be adjusted at some point. We believe that one day many SoMe services will be similar to each other in terms of the number of features they support. That is why grouping SoMe services according to their educational uses was a challenging process. ¶ 68 Leave a comment on paragraph 68 0 Each factor will be discussed briefly below. ¶ 69 Leave a comment on paragraph 69 0 From the knowledge levels point of view, we decided to rely on the cognitive dimension of Bloom’s revised taxonomy, because it is a very strong theoretical framework used for many years by both educators and researchers (Anderson et al., 2000; Bloom, 1956). ¶ 70 Leave a comment on paragraph 70 0 Many of the SoMe classes are appropriate for the lowest level of knowledge. When the level of knowledge increases, the number of appropriate SoMe classes decreases. For instance, creativity is the highest level of knowledge and requires a high level of skills. Therefore, not all SoMe classes are appropriate for this level. On the contrary, remembering and understanding are the lowest level of knowledge and can be viewed as a starting point for any course. They do not require a high level of skill, and almost all classes of SoMe match this lowest level of knowledge. ¶ 71 Leave a comment on paragraph 71 0 Content types were also found to be important for making decisions about SoMe. Hence, based on a recent review of literature (Bower, Hedberg, & Kuswara, 2010; McLoughlin & Lee, 2007; OECD, 2007; Safko, 2012), we decided to ask instructors which of the following five types of content they have and typically use in their teaching: (1) text, (2) video, (3) audio, (4) visual, and (5) animation / simulation. ¶ 72 Leave a comment on paragraph 72 0 In terms of instructional methods, we decided to provide six well-known approaches to teaching; three of them teacher-centered and the other three learner-centered, since this classification is well-known and widely used by educators (Arends, 2011; Borich, 2013; Burden & Byrd, 2013). ¶ 73 Leave a comment on paragraph 73 0 Finally, the types of assessment instructors intend to use could be an important point in making the decision about which SoMe class is the most appropriate. For the purposes of this research, the assessment types were classified as (1) alternative and (2) classic. ¶ 74 Leave a comment on paragraph 74 0 The literature review revealed different classifications of assessments. The first one divides assessment types into summative and formative (Garrison & Ehringhaus, 2007), and the other one into classic and alternative (Pressley & McCormick, 2007). Since there is no common paradigm for the educational systems of different countries, the terms “classic” and “alternative,” which are more general, were used to classify assessments in this project. ¶ 75 Leave a comment on paragraph 75 0 Therefore, the above four factors were considered while forming the decision matrix, which is the basis for the algorithm that provides suggestions for the most appropriate classes of SoMe to instructors. SoMe classes were analyzed separately in terms of each of these four factors. These four factors also form the pedagogical basis of the toolkit. All important aspects of instructional design are questioned for pedagogical concerns in order to return a reliable suggestion. The resulting decision matrix is the path to defining the most suitable SoMe class for an instructor’s teaching purposes. ¶ 76 Leave a comment on paragraph 76 0 The below decision matrix (Table 2) was formed based on the previously mentioned classifications and decisions. This matrix is used for decision-making by matching patterns in the flow of the program. ¶ 136 Leave a comment on paragraph 136 0 As can be seen in Figure 1 below, the toolkit has four major components: (1) the start page, which welcomes the user and explains what service the toolkit offers and what the target group is (instructors in HE); (2) the query wizard, which asks four questions (knowledge levels, content types, instructional methods, and assessment type) in order to analyze the teaching situation in which the instructors want to apply SoMe; (3) the results page, which will display the most suitable class of SoMe based on the previous entries;5 and (4) additional information about the suggested SoMe class, displayed upon request to instructors who would like to see examples of instructional tips and ideas about how to integrate SoMe into their teaching process.6 The resulting possible user/machine interaction is displayed in the swim lane “What the User Does.” There will be a template in the toolkit allowing the users to leave feedback. However, it is not yet implemented and is therefore omitted from Figure 1. ¶ 138 Leave a comment on paragraph 138 0 In this paper, we presented the pedagogical basis for the toolkit that, we hope, can provide educational support to instructors teaching in HE classrooms and enrich their teaching activities by incorporating SoMe services. This toolkit is in its preliminary stages and will likely be modified and enhanced through continuing user feedback. Technological tools, user interfaces, and features change considerably all the time and it is hard to keep up with these changes. Hence, in the toolkit we tried to address forthcoming features of SoMe and tried to group them according to these features that also support educational use. We tried to shape our decisions based on several pedagogical concerns and matched these expectations with the features of SoMe. Therefore, the toolkit provides not only some insight about which class of SoMe an instructor should use but also possible instructional tips and ideas that can be implemented in his or her teaching. Going through all of the details and ideas provided in the toolkit is aimed to shape the instructor’s mind in terms of potential use cases and to create an insight about the use of SoMe in education. Thus, we believe that going for additional information is more important than limiting oneself to the SoMe class suggested by the toolkit. ¶ 139 Leave a comment on paragraph 139 0 In line with the motto of the conference, we hope that successful SoMe usage for teaching in HE can contribute to creating an open and more social and unbound space for learning, among students and between students and instructors. 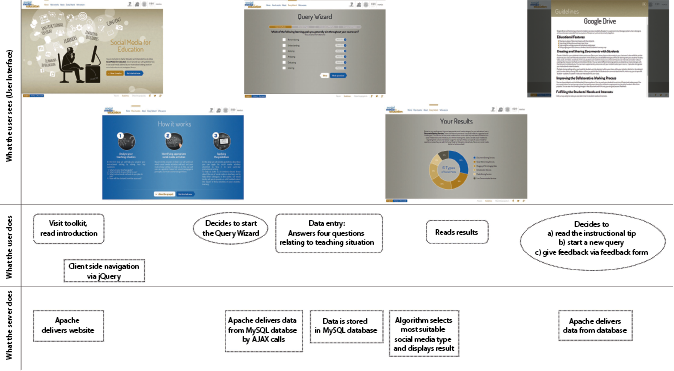 Regarding the conceptual and technical basis for the toolkit, we have to test the user feedback and the working (i.e., the fit of the suggestions) of the algorithm. We invite you to join us for that purpose in the session. ¶ 140 Leave a comment on paragraph 140 0 Future research studies could concentrate on several problems emerging due to SoMe usage for educational purposes. Copyright, privacy, and data security issues should be investigated; threats should be revealed; and solutions may be provided. Students’ use of SoMe as their “research facilities” could be studied, and ways of encouraging students to use more services for collaboration should be identified. In such a socially connected world, attempts to make effective and efficient use of technological tools should continue. There is a large amount of data and thousands of users. We are just exploring for what purposes different types of technology are most beneficial and how to effectively integrate technology into educational contexts. ¶ 141 Leave a comment on paragraph 141 0 Anderson, L. W., Krathwohl, D. R., Airasian, P. W., Cruikshank, K. A., Mayer, R. E., Pintrich, P. R., Raths, J. & Wittrock, M. C. (2000). A taxonomy for learning, teaching, and assessment: A revision of Bloom’s taxonomy of educational objectives. New York: Pearson, Allyn & Bacon. ¶ 142 Leave a comment on paragraph 142 0 Arends, R. (2011). Learning to teach (9th ed., rev.). New York, NY: McGraw-Hill Higher Education. ¶ 144 Leave a comment on paragraph 144 0 Bloom, B. (1956). Taxonomy of Educational Objectives, Handbook I: The cognitive domain. New York, NY: David McKay. ¶ 145 Leave a comment on paragraph 145 0 Borich, G. D. (2013). Effective teaching methods: Research-based practice (8th ed.). Upper Saddle River, NJ: Pearson Merrill Prentice Hall. ¶ 146 Leave a comment on paragraph 146 0 Bower, M., Hedberg, J. G. & Kuswara, A. (2010). A framework for Web 2.0 learning design. Educational Media International, 47(3), 177–198. ¶ 147 Leave a comment on paragraph 147 0 Burden, P. R. & Byrd, D. M. (2013). Methods for effective teaching: Meeting the needs of all students (6th ed.). Boston: Pearson, Allyn & Bacon. ¶ 151 Leave a comment on paragraph 151 0 Gülbahar, Y. (2014). Current State of Usage of Social Media for Education: Case of Turkey. Journal of Social Media Studies, 1(1), 53–69. ¶ 152 Leave a comment on paragraph 152 0 Gülbahar, Y., Rapp, C. & Kilis, S. (2014). Validation of Social Media Toolkit: Peer reviewed Paper. Accepted. Ireland International Conference on Education 27-29.10.2014. Dublin, Ireland. ¶ 153 Leave a comment on paragraph 153 0 Lim, U. (2013). Anforderungen an die E-Medienkompetenz Studierender. [Research on the media use for studying and on students’ media literacy] (n=928). Unpublished. Zurich University of Applied Sciences (ZHAW). ¶ 154 Leave a comment on paragraph 154 0 Manning S. & Johnson, K. (2011). The technology toolbelt for teaching. San Francisco, CA: Jossey Bass. ¶ 157 Leave a comment on paragraph 157 0 Pressley, M. & McCormick, C. (2007). Cognition, teaching, and assessment. New York, NY: Harper Collins College. ¶ 158 Leave a comment on paragraph 158 0 Rapp, C., Gülbahar, Y. & Erlemann, J. (2014). Social Media for Education – A Toolkit for Supporting Instructors in Higher Education Enriching Their Teaching with Social Media. Poster Presentation (peer reviewed). Accepted. Social Media & Society 2014 International Conference. 27-28 September 2014. Toronto, Canada. ¶ 159 Leave a comment on paragraph 159 0 Richardson, W. (2010). Blogs, wikis, podcasts, and other powerful web tools for classrooms (3rd ed.). Thousand Oaks, CA: SAGE. ¶ 160 Leave a comment on paragraph 160 0 Safko, L. (2012). The social media bible: Tactics, tools, and strategies for business success (3rd ed.). Hoboken, NJ: John Wiley & Sons. ¶ 161 Leave a comment on paragraph 161 0 1 Social Media as Catalyser for Cross-National Learning (SoMeCat) (www.somecat.org). ¶ 162 Leave a comment on paragraph 162 0 2 The functioning and justification of the algorithm is beyond the scope of this paper, but is discussed in Gülbahar, Rapp & Kilis (2014). Also, the technical basis for the toolkit has only been sketched out; for more information see Rapp, Gülbahar & Erlemann (2014). For the first presentation and discussion see: https://www.eduhub.ch/conferences-events/eduhub-webinars/social-media-for-education/. ¶ 163 Leave a comment on paragraph 163 0 3 The WP reports will be published open access after editing here: http://www.somecat.org/conferences-and-workshops/. ¶ 164 Leave a comment on paragraph 164 0 4 Content and empirical basis for the social media strategy is, unfortunately, beyond the scope of this paper. A paper was presented at http://www.eden-online.org/eden-events/upcoming-conference.html. Brief information can be found here: http://www.somecat.org/proposed-framework-for-social-media-strategy/. ¶ 165 Leave a comment on paragraph 165 0 5 In case of a tie between two social media classes the user can assign preferences. ¶ 166 Leave a comment on paragraph 166 0 6 We decided not to provide guidelines on how certain SoMe services are used technically (e.g., how to send a tweet in Twitter). There are numerous sites explaining that; and technology services and their functions/usage change rapidly (which poses major problems with updating). We focused, rather, on the guidelines on how to use the SoMe class for educational purposes (similar to Manning & Johnson, 2011; Richardson, 2010). This entry is filed under 9. Softwaregestaltung ist Raumgestaltung, Hands-on Session. You can follow any comments on this entry through the RSS 2.0 feed. You can leave a comment, or trackback from your own site. I am kind of curios: why are „social bookmarking“ and „research“ are not relevant in your context? Especially in Higher Education teaching I would think that they are most relevant. „Social bookmarking“ is information research and organisation, research is part of the educational goals we have as university teachers.